The Kawanishi N1K was designed as a robust floatplane fighter that was more capable than the A6M2-N Rufe (Zero floatplane) and could provide the Japanese Navy with front-line fighter support where runways are not yet available. Designated as the N1K1 Kyofu (Rex), the aircraft started service entry in 1943, but by that time, Japan's forward momentum had been blunted and was being pushed back. Even as the N1K1 was in production, the Kawanishi engineers foresaw the potential of this powerful aircraft if it could be separated from its heavy floats and a land-based variant was developed with conventional landing gear. Designated N1K1-J Shiden (George), the aircraft had serious potential but also exhibited some latent issues based upon its floatplane heritage. A redesign was begun almost immediately to move the wings from mid-fuselage to low-wing, the fuselage was lengthened for greater stability, and it was designed with roughly 1/3 the parts of the N1K1-J. 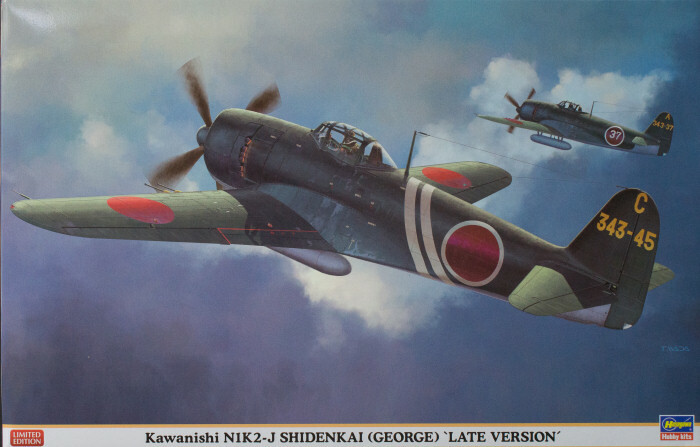 This new aircraft was the N1K2-J Shiden-Kai and with this aircraft, Japanese Navy pilots had a formidable fighter that could match the F6F Hellcat and the P-51 Mustang. While the aircraft was very successful, it couldn't be produced fast enough to change the outcome of the Pacific air war. Last year, Hasegawa released an all-new-tool kit of the N1K2-J in 1/32 scale representing the early version of the Shiden-Kai. Here is the follow-up release changing the tail and a few other details to render the late-production version. 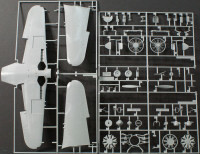 Molded in light gray styrene, this kit is presented on seven parts trees plus one tree oc clear parts. This kit is easily the best kit of the Shiden-Kai in any scale and Hasegawa holds the title for best N1K2-J in 1/72 and 1/48 scales as well. If you haven't built one of these new-tooled 1/32 kits in a while, you'll note that Hasegawa uses a modular approach to the kit design to facilitate difference versions with smaller parts changes. In this case for example, the tail section plugs into the rear of the fuselage allowing for a taller tail of the early version or the shorter tail of this late production version. Likewise underwing panel inserts also allow the differences in the underwing details to be represented without tooling an entire lower wing section. If you're skeptical of the fit, don't be. I've built their modular 1/32 P-40 series using plug-in tails and inserts and the fit was nearly perfect. The model is designed to be handled as it has three fuselage bulkheads designed to keep the fuselage from flexing plus the integral bulkhead in the tail insert. Likewise the wings have a mainspar that will help keep the wings from flexing as well. Even the interlocking horizontal stabilizers will help make this model nearly bulletproof so you won't hear that fleeting 'snap' of a seamline while showing off the model or transporting it to a model contest. As I said above, this is easily the best kit of the George in any scale with Hasegawa holding the best in 1/72 and 1/48 as well. Platz has the best in scale for their 1/144 kit and Bandai remains unopposed in 1/24 scale.